Take laps every day this winter, even on the wettest of snow days wearing the DC Nomad Snowboard Pants for Men. DC designed the Nomad snowboard pants for the rider that is looking to get out on the slopes every day, no matter what the weather is like. The Nomads are designed with Sympatex and Weather Defense 30 making these snow pants extremely waterproof as they have no pores in the fabric and feature 30k of waterproofing technology. The Nomad snowboard pants have fully taped seams, DWR coated boot gaiters and DC's jacket-to-pant attachment system will aid in keeping moisture and unwanted wind drafts from getting into the pants. Designed with articulated legs so you can bust a move in these snowboard pants without feeling restricted. The internal waist adjustment allows for a personalized fit from day to day while the mesh-lined leg venting allows for a quick cooldown when you are working up a sweat. 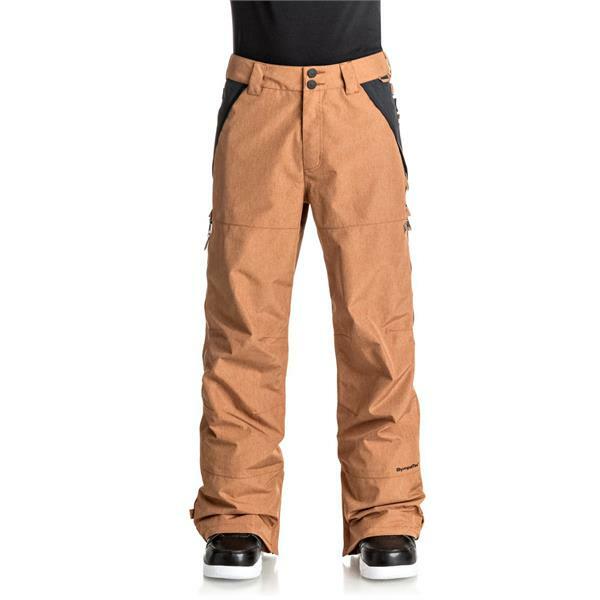 This winter hit the slopes in the super waterproof DC Nomad Snowboard Pants for Men. Awesome ski/snowboard pants! Fit the description very accurately to size dimensions, color, material, etc. These pants also came with several convenient features I didn't even realize they had until the first time wearing them. Definitely a good buy. Should I size up for room to layer? BEST ANSWER: You definitely can. I suggest checking the 'sizing & fit' chart. If you are on the top end of a size, going up a size would benefit you with more room. However, it depends on how thick the layers you're wearing underneath are. I would measure yourself with and without the base layers on to find the best fit for you! No, I was able to wear a few base layers under these pants for a trip.